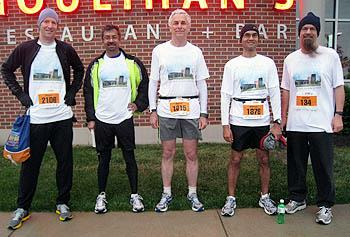 Several ECE faculty who ran in the Illinois Marathon took part in a fundraiser for the new ECE building. Students donated money to have one of these faculty wear a wig and cape down Green Street during the Marathon. Contributions were over $600, and ECE Professor Andy Singer wore the wig and cape. Several ECE faculty participated in a student fundraiser to raise money for the new ECE building. From left: Dan Wasserman, Sanjay Patel, Bruce Hajek, Naresh Shanbhag, and Lippold Haken. Not pictured: Andrew Singer. Several ECE faculty took their love of running and used it as a way to help support and to help spread the word of the ECE building campaign. They used their participation in the Illinois Marathon held in Champaign on April 28 as a way to involve students in the ECE building campaign. Participating faculty included Bruce Hajek, Lippold Haken, Sanjay J. Patel, Naresh R Shanbhag, Andrew Singer, and Daniel M Wasserman. Andrew Singer (left) and Naresh Shanbhag await the start of the Marathon. Scholl spearheaded the logistics of the fundraiser. It was relatively simple in its execution. Cans with the photos of participating faculty were placed in the IEEE/HKN office for a week prior to the race. Students dropped money into the can of their favorite faculty member. The person with the most money collected would wear an orange wig and a cape as he ran down Green Street during the early part of the race. In the end, the students raised over $600 for the new ECE building. 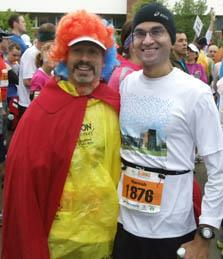 The winner of the fundraiser was ECE Professor Andrew Singer, who wore the wig and cape as he ran down Green Street. “I was happy to participate, and everyone had fun with it,” said Singer. All faculty who participated in this fundraiser wore matching T-shirts as they ran. The T-shirts featured a rendering of the new ECE building under construction.